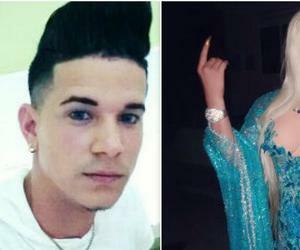 Young Cuban Transformer: "There are people who do not assume that I am a man when the show is over"
José Julio Padilla is also Alexa Valenti. The same young student of Social Communication at the University of Camagüey, climbs the stage dressed as a woman and ventures into the art of transformism. However, this young Cuban does not stop facing the stigma of everyday life within a macho society. His passion, therefore, has also influenced his relationships as a couple. "I have had relationships with people who have loved me, but this passion of mine always slows me down, they say that they do not assume me as a man after seeing me in a show, that is sad and absurd, because transformism is an artistic work that lasts "After a certain time, you're the same person you were before," Padilla told local newspaper Adelante. However, the young man has received all the support of his family: "From my family I am very grateful. They have supported me from the first moment, they go to my presentations, they give me encouragement, "he says. In the interview given to the aforementioned newspaper, Padilla talks about everything that involves working as a changemaker: "I think it is very admirable, once the public knows what it is, thanks. Unfortunately for the taboos and stigmas that we suffer our presentations do not reach beyond a gay party or a gala against homophobia. Sometimes we go to the communities and people like it, as long as it is done with respect, without embarrassment. " At 17, Padilla dressed for the first time as a woman: "When I saw transformism for the first time, I said to myself: I would like to try it. I had very good friends who helped me and that's how I managed to do it. I think that to be a beginner it went well. It was very fun, a unique experience. " "My first name as a changemaker was Hermione, one of the protagonists of the Harry Potter series, because I liked that character very much. Then I had the Gala because I saw it in a reality show and I liked it for being simple, but impressive; until I got my stage name from Alexa Valenti. Two friends suggested it to me, while the surname was taken from the one used by another quick-change artist, the person who helps me in the artistic world, "he said. The repertoire of the young man is composed of the singers Pastora Soler, Mónica Naranjo and Malú, Edith Márquez, Myriam Hernández and Gloria Trevi, for whom he feels admiration. Padilla also mentions icons of Cuban transformism that have also been his motivation, such as Ashenal and Imperio. At this time, the young man is also venturing as an activist: "I am starting as a health promoter, to raise awareness, especially in the LGBTI community, about protection against STIs and the HIV virus. I think that with this work and also through the culture, I bring something positive and it makes me a good person ".